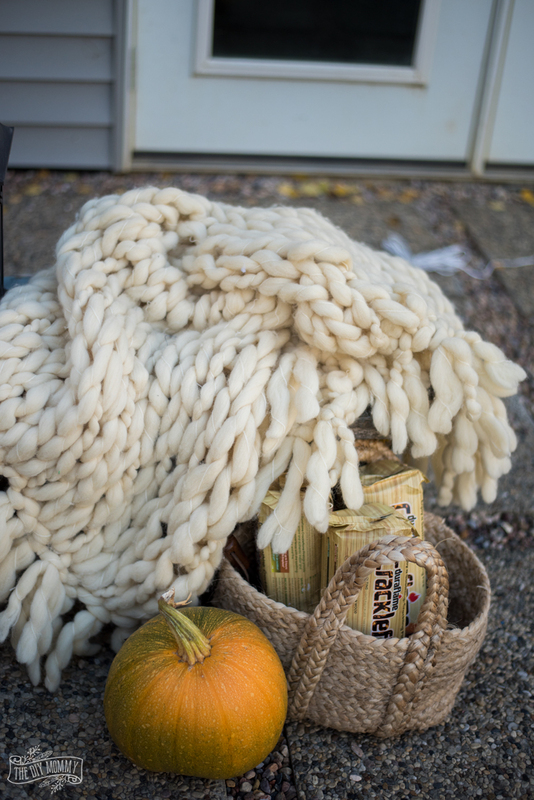 Fall feels like such a short season here in Alberta, Canada – it’s almost like we go right from summer to winter! – but I want to enjoy it to its fullest. 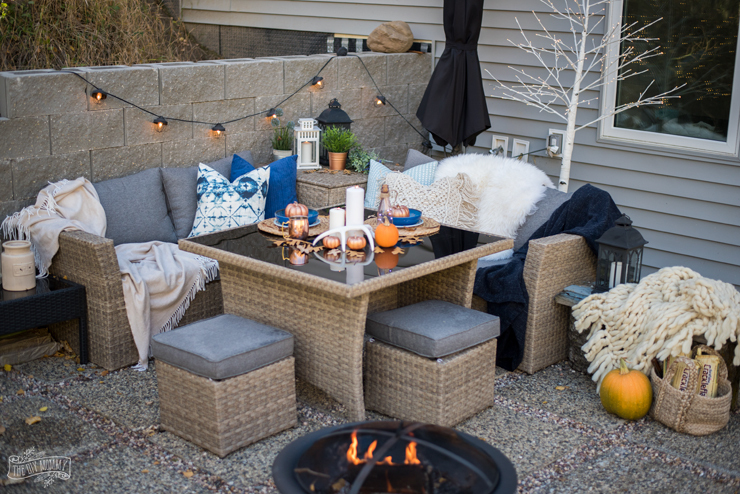 On a warm stretch last week, I made our new back patio nice and cozy and ready for some Fall marshmallow roasting by adding some simple autumn decor touches. 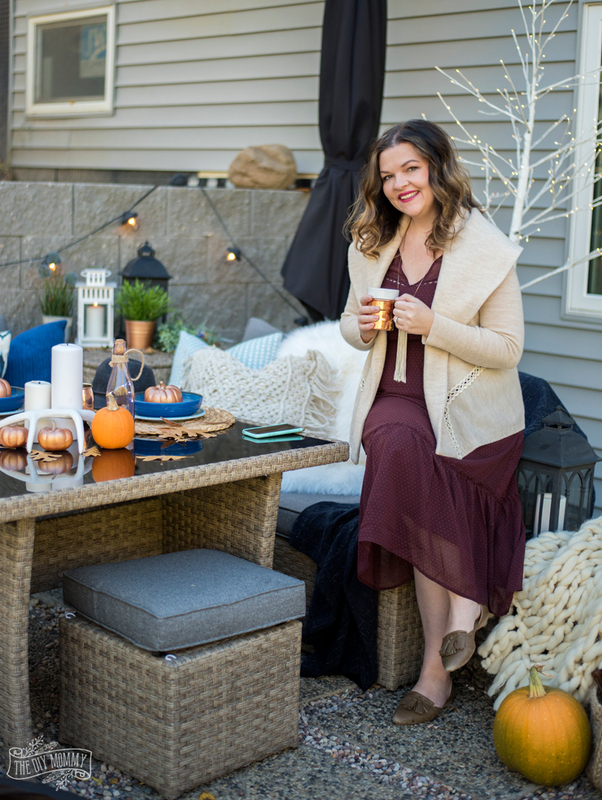 If you want to make your outdoor space look cozy and beautiful for Fall, here’s my no-fail “recipe” to achieving that perfect autumn patio look! 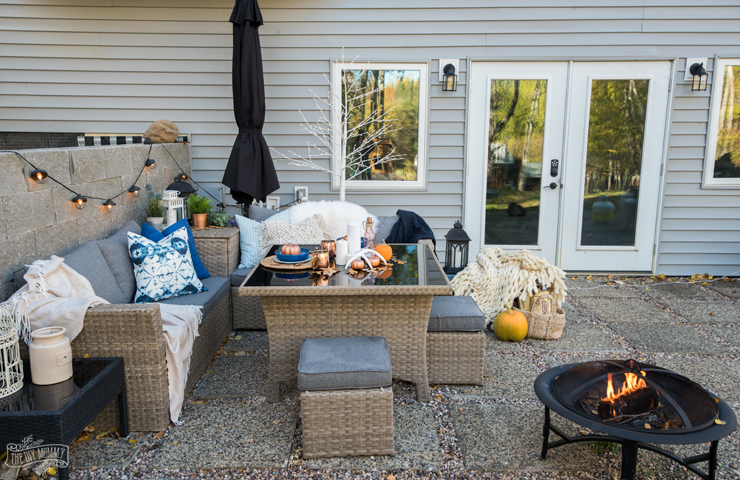 The air gets a lot crisper and chillier during the autumn months, so additional throw blankets, furs and pillows will add both actual warmth and visual warmth to your outdoor space. 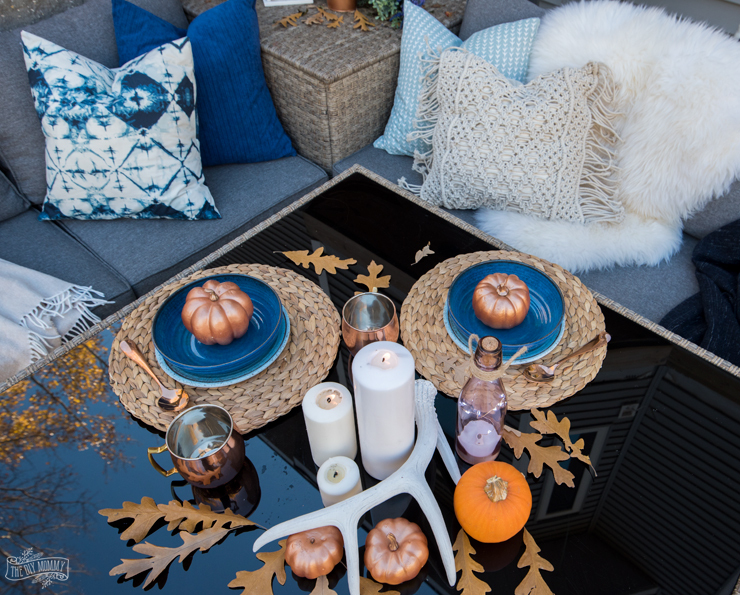 For our patio, I added pillows in vibrant blues to contrast the orange of the Fall leaves, along with a sheepskin rug, a handmade arm-knit blanket, and some extra throw blankets. There’s nothing more beautiful than the twinkle of lights and candles on a cool Fall evening outside. 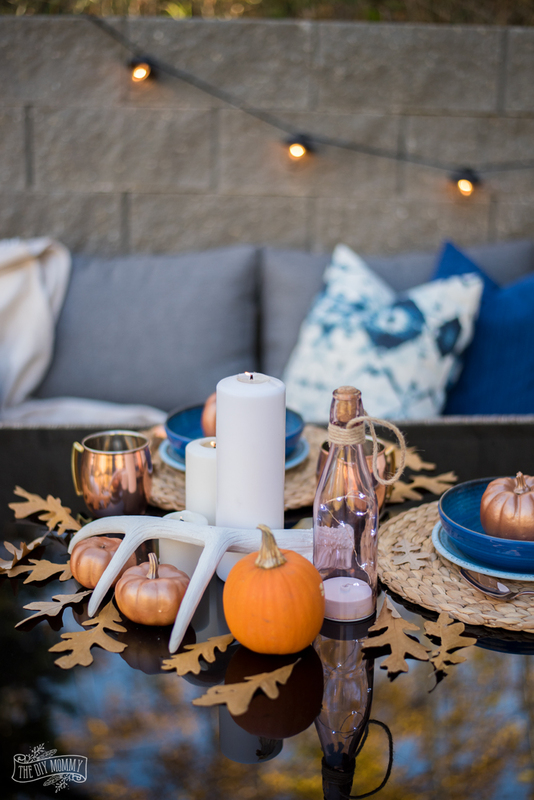 You can add light to your outdoor space with candles, string lights, faux lit trees and fairy lights in jars. 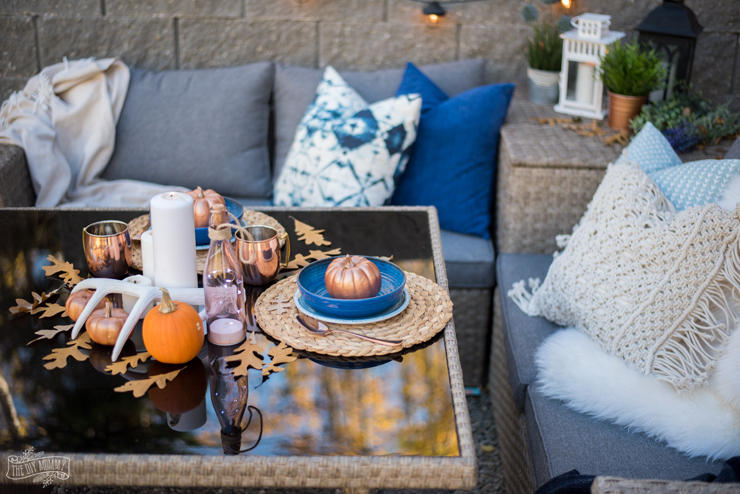 Making your outdoor space more Fall-like can be as simple as adding in natural autumn elements into your decor like dried leaves, branches and pumpkins. 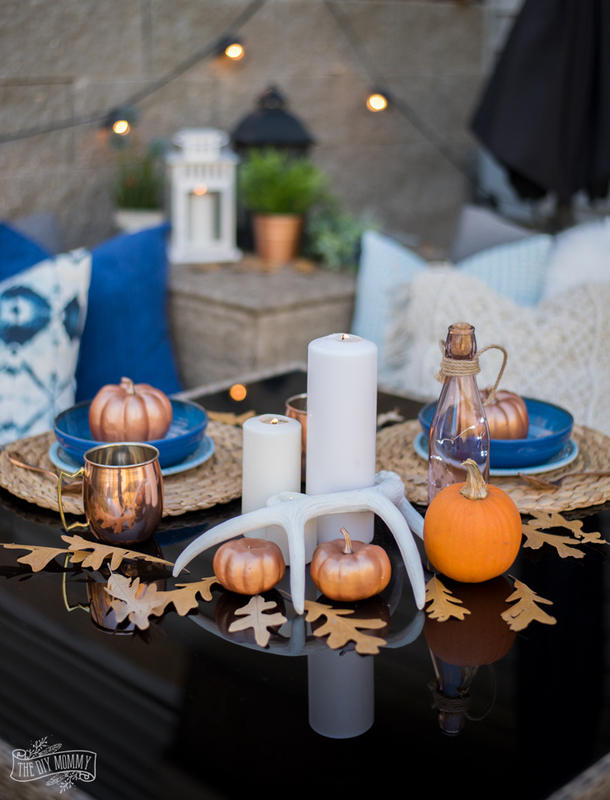 I’ve used some dried oak leaves and pumpkins from our garden to make our patio feel seasonally appropriate and natural. 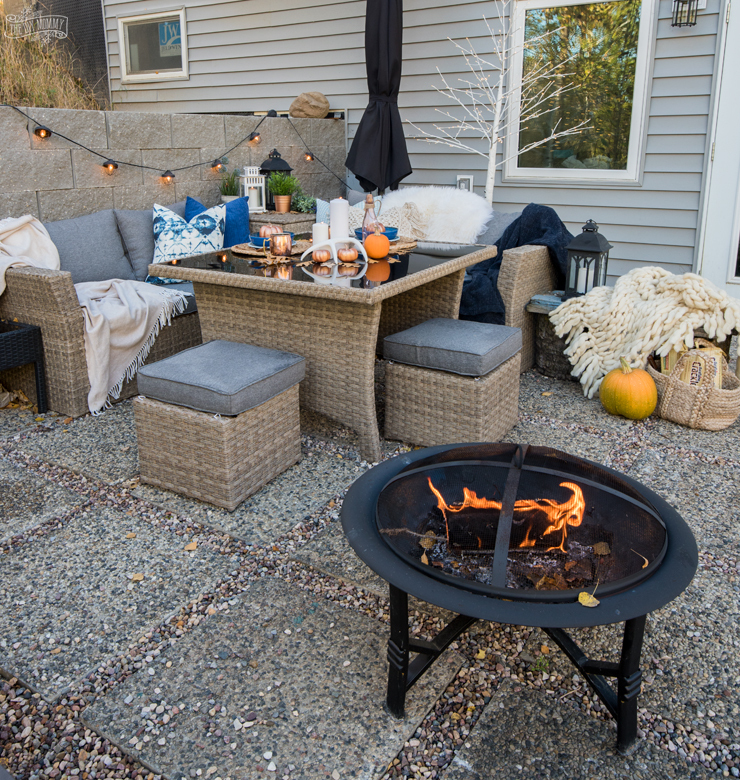 An outdoor fire is both beautiful and practical in a Fall outdoor space. 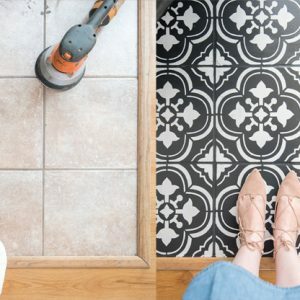 It helps keep you cozy and warm on those crisp evenings, but it also adds life and warmth to the overall look of your patio. 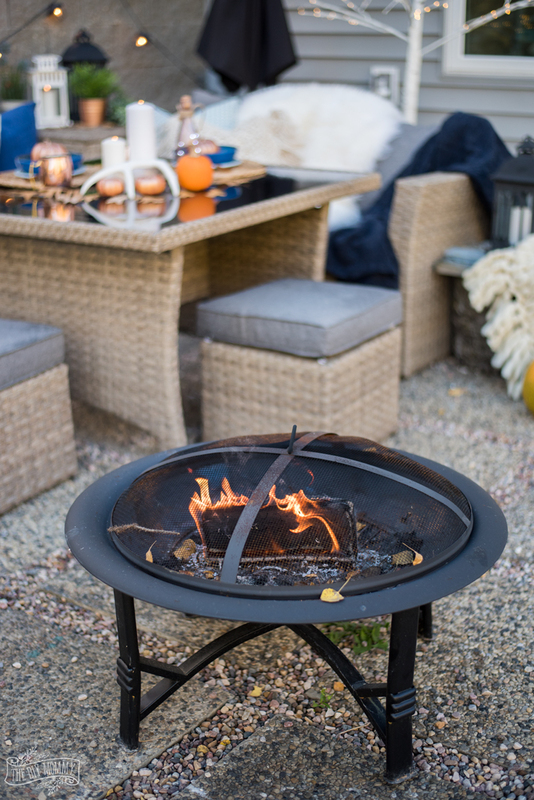 I like to use Duraflame Crackleflame firelogs in our outdoor fire pit because they’re incredibly easy to light and they last for a long time. 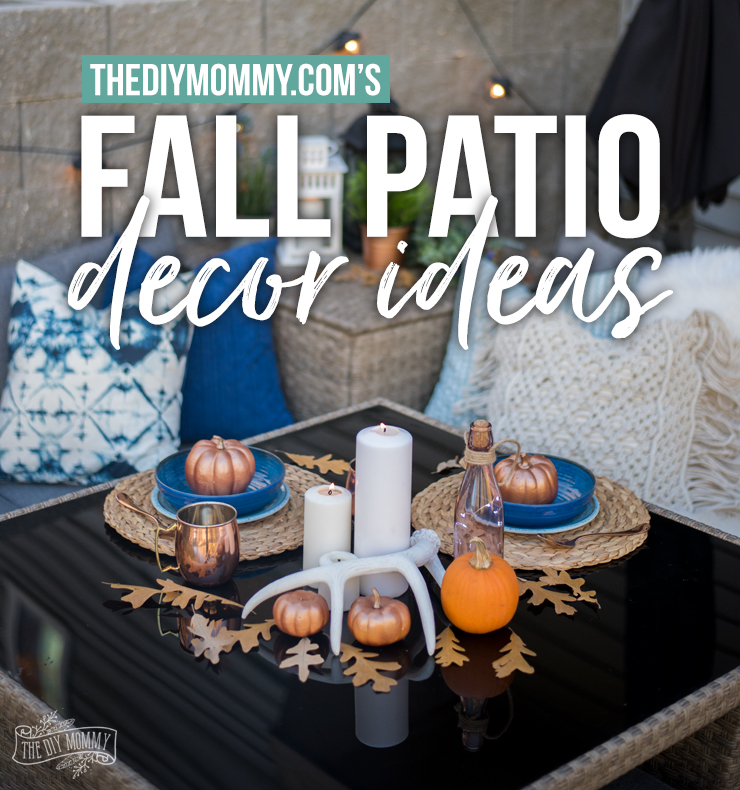 They also give off a soothing crackling sound to add even more coziness to our Fall patio. 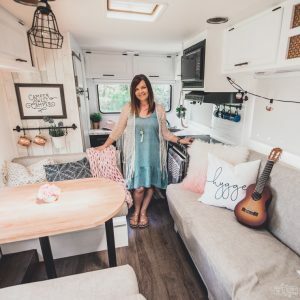 I hope you found those tips helpful as you enjoy your outdoor space this Fall! Disclaimer: This post is sponsored by Duraflame. 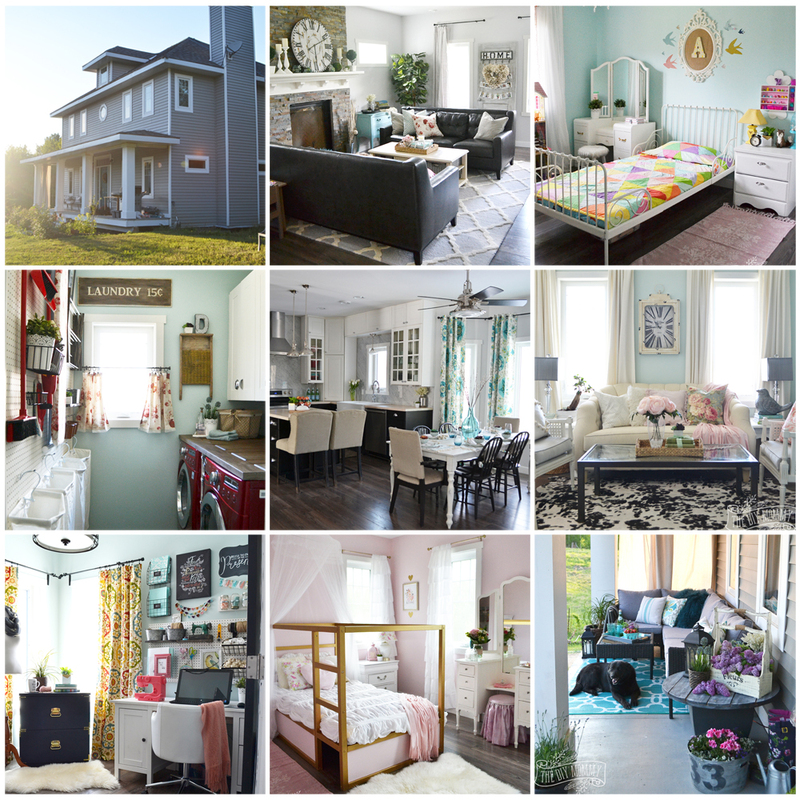 As always, all of the opinions here are my own. 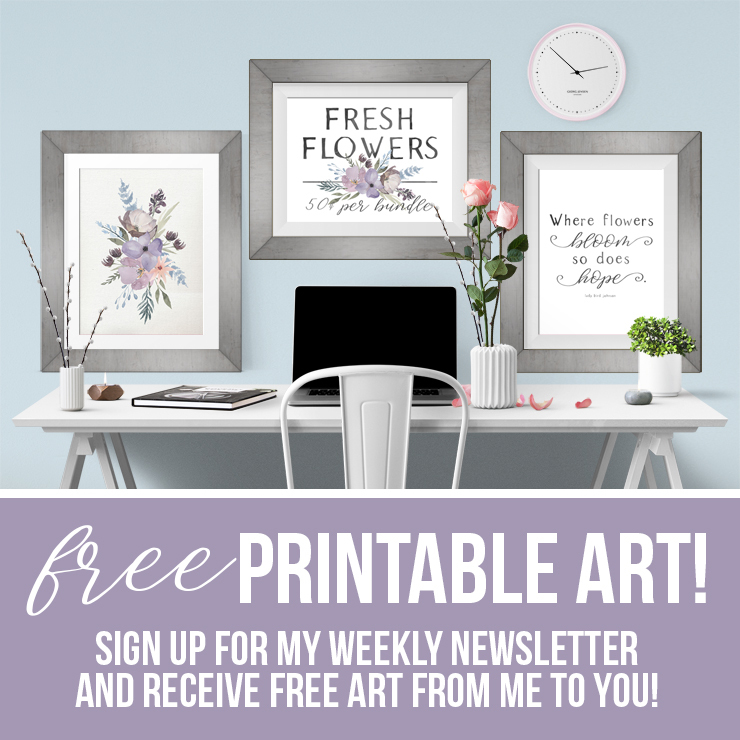 INCREDIBLE! 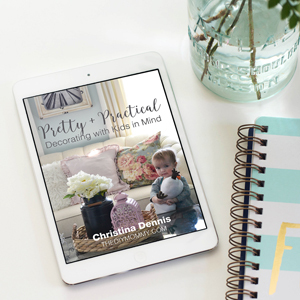 Love your patio and pinned!